Here is a link to the spreadsheet I made comparing the costs of these organic berry jam options. 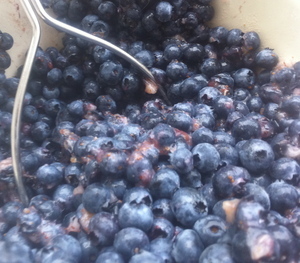 As the shelves in the basement fill with organic blackberry jam and organic blueberry jam - both picked by yours truly and my family at Makielski Berry Farm and Toth Brothers Blueberry Farm - I began to wonder if I was saving any money doing this myself. So I trawled the grocery shelves for a comparison equivalent to what I make - just organic fruit and pectin. 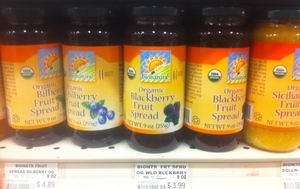 I found Food for Thought Organic Mixed Berry sweetened with juice from Homer, Michigan and Bionaturae Organic Fruit Spreads from Italy, via Connecticut. I assumed that each mile was reimbursed $0.50 for land and $1.29 for sea, as illustrated on the IRS website. I paid myself $8/hour for the 3 hours of labor it took me to pick and make 16 jars of jam. I was hoping to show I am saving my family money by doing it myself. I didn't. In fact, adjusting for the assumption the two companies are sending their jars of jam in bulk cases - my own homemade, hand-picked efforts do not compete at all with the economies of scale evident on a per ounce price basis for the other jams. The prices came out virtually the same - $0.79/ounce for my homemade jam vs $0.77/ounce for both Food for Thought and Bionaturae equivalents. Bionaturae’s spreads travel over 4500 miles to get to Ann Arbor, my berries came from around town - 64 total roundtrip miles. However, assuming that Bionaturae sends 150 cases at a time, with 12 jars in a case - that works out to $0.29/mile/ounce as compared to my mileage of $0.25/mile/ounce (I assumed 16 jars for my traveling). Assuming that Food for Thought sends 50 cases at a time - that works out to only $0.02/mile/ounce. Curious about the hidden costs, I attached a per ounce carbon footprint to the jams, with the associated costs. According to TerraPass, a website that sells carbon footprint offsets to individuals, 1,000 lbs of carbon costs $5.95 to offset, which turns into a cost of $0.00205/CO2/ounce assuming the transporting of the jam is taking place on a diesel Mack semi-truck (and that trucks can drive on water from Italy). However, once again, given the economies of scale involved in transporting bulk jam, the carbon footprint of eating jam from Italy is negligible. It is only once we assume that Bionaturae and Food for Thought are sending one case at a time do the numbers move in favor of making jam at home. In that scenario, the Italian jam becomes $44.50/ounce or $400.50 jar and the Homer MI jam becomes $1.94/ounce or $18.43/jar - compared to my homemade effort at $6.40/jar for freshly picked organic jam. My back of the envelope calculations tell me there is no fiduciary advantage to making berry jam a home, even when adding in the carbon footprint of the food miles. Which leaves the priceless intangible benefits - the joy of picking berries as a date on the weekend, feeling the quiet between the rows as the bees buzz in the summer heat, smelling the cooked fruit on the second floor hours after the canning process is complete, the satisfaction of handcrafting food for one’s family and friends, the pleasure of talking to the family who grew the fruit, and the expectation of opening a jar in the middle of January and remembering what it felt like to be warm in a tank top and see one’s brown toes in the dry grass. To me, there is no comparison.